The very first time I booted StarRay, I got the strangest feeling I'd played this game before. In StarRay, you pilot the ship that provides the game's name. Your mission is pretty simple: Blast all the invaders to atoms before they kill you or destroy all the vital installations on the planet you are defending. The planet is many screens wide and wraps around horizontally so you can fly continuously in one direction and circle the world. Fortunately, you have a long-range radar screen that shows the entire planet's surface so you can locate enemies and installations that are under attack. The StarRay can thrust left or right, move up and down the full height of the screen and is vulnerable to collisions with its enemies and the shots they fire. The types of attackers vary from wave to wave because there are actually seven different "worlds" to defend (you must survive three waves on each one), each with its own dangers. For example, on the first planet, called Gorbaxa, there are Landers (gee, this sounds awfully familiar), Krellian Mother Ships that shatter into a bunch of tiny attack ships when you hit them and so forth. On the second planet, called Sirion, you'll encounter Landers and weird little beehives that split into a bunch of fragments that shortly turn into batlike creatures...sounds kinda like those Krellian Mother Ships, eh? If you spend too much time completing a wave, vicious Blue Hunters will start zipping around and try to kill you. Okay, maybe the bard didn't put it quite that way. 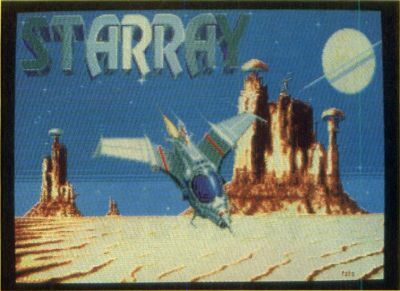 But the quote fits because StarRay, by any other name, seems to be a graphically souped-up and modified version of the classic arcade game Defender. There are differences between this game and Defender, but mostly they are of the cosmetic variety. For example, on each planet there will be a different kind of installation for you to defend, ranging from energy cells to forest robots and antigravity generators, but their basic function is identical to that of the humanoids in Defender. You must defend them, else the Landers will land on them (hence the name) and convert them into something nasty, like gun employments. Unlike Defender, the Landers do not have to lift the target to the top of the screen in order to carry out their nefarious schemes. They merely have to park their buns on the target installation for a short time and the dreadful transformation will occur. If an installation is so corrupted, it is considered lost, and you should destroy it. 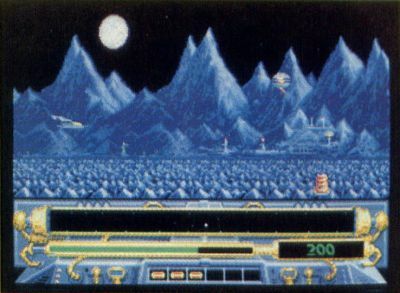 If all the installations are corrupted and/or destroyed rather than being blown into deep space, as Defender would do, the screen slowly fades to black, and the game ends. No second chance. The StarRay fighter is equipped with a rapid-fire forward-shooting laser and a limited supply of "vaporizers," which will destroy all opponents on the screen (but not their shots!). You should be careful of the installations when shooting at ground level. Fortunately, the installations are unaffected by your smart bombs...oops! I mean vaporizers! This is all very much like Defender, however, unlike its inspiration, StarRay does not feature any sort of hyperspace option. Okay, okay, I've jumped on the Defender parallel more than enough. But just because it's a Defender-type game, does that make it bad? StarRay is a solid piece of programming. The graphics move quickly and smoothly. The sound is good, but not outstanding. The thing that makes this game fun is that it's a well-balanced blend of smooth play action and good graphics. And speaking of graphics, in this department StarRay leaves Defender in the interstellar dust. No mere outline of a planet's surface in front of twinkling stars in this game. The scenery is loaded with detail. Zooming through the jungle of Sirion, you'll see no less than six levels of background detail scrolling by on the jungle floor, in addition to the tall trees is the background and the sky beyond. The sensation of movement and depth is very good. Each planet appears for three waves, then it's off to the next one. There are a total of seven planets, each with its own unique look and its own pitfalls. The third planet, Sharlon, is covered in ice and snow. Ice floes fill the oceans. Landers are there, as always, as are the expected pod-type ships (that split into many ships when you hit them). But there's a new danger here: Shoot one of the funny-looking satellites floating halfway up the screen and it starts spinning wildly, generating interference that screws up your radar! Higher up in the game are collapsing cave passages, guided missiles and so on. There's one drawback to these super-detailed graphics, and that's a cluttered screen. It's easy to crash into something you didn't see when you're zooming along at maximum speed. The smaller aliens can get lost in the background blur. As far as the screen display goes, the radar scan, your shield level, score and number of vaporizers appear at the bottom of the screen rather than the top. I found that as I tried to keep the invaders from getting too low, my eyes tended to be fixed more toward the top of the screen than the bottom, and thus checking the status of my shields and so forth forced me to continuously look away from what I was doing, sometimes with disastrous results. There are other aspects of StarRay that differentiate it from Defender. First, you have only one ship and do not get extras. When you die, it's all over. The way Star-Ray makes up for what would otherwise be a fatal flaw is that the ship is equipped with a shield that can withstand a number of hits before it collapses. Your single ship can actually survive more hits than the total number of ships you start with in Defender. When you blast a Lander, it doesn't always just vanish without a trace. Sometimes a Bonus Ball will appear in its wake. Picking these up (by touching them with your ship) will enhance the StarRay fighter in various ways. Bonus Balls are labeled with a letter that describes their function. "A" stands for improved acceleration, "C" gives you continuous fire for 100 shots and "I" provides ten seconds of invulnerability (great for ramming through a bunch of invaders). They can be destroyed by laser fire and disappear after a short time if you don't collect them. Bonus Air Buses will appear if you are doing well. If you shoot these, they will drop a bonus object, which you must touch to collect. Control can be either by keyboard or joystick, though I found the joystick to be more intuitive. The lasers are fired with the joystick fire button, but the vaporizers/smart bombs must be triggered with the keyboard. Which key? The space bar would be the obvious candidate, but did the programmers use it? Nope. They used the CapsLock key. Imagine trying to find the CapsLock key during that desperate moment when you need a vaporizer. Good luck! The space bar pauses the game and brings up a menu of options allowing you to do such things as enable/disable the music and sound effects, restart the game at any of the first four planets and even enables a "Last Game Option," which will stop StarRay dead in its tracks at the end of the current game, preventing you from playing "just one more game!" The game features background music that, while not bad, I found distracting. With it on I couldn't hear the sound effects well and found it easy to miss the sound that warns you when an installation is under attack. Fortunately, you can disable the music. You can also disable the sound effects (which makes the game play faster and harder), but I prefer the sound. If you have one megabyte or more RAM, the title screen will be accompanied by digitized music, which can be output through an ST Replay cartridge (if you have one) and played through your stereo. Great, except that I don't particularly like the title music, and the other sounds in the game (including the background music) can't be output in this manner. The most annoying thing about the title music is that every time the game ends, the program reloads the title screen and music and plays it again. Fortunately, one button press kills it, but it's annoying nonetheless. 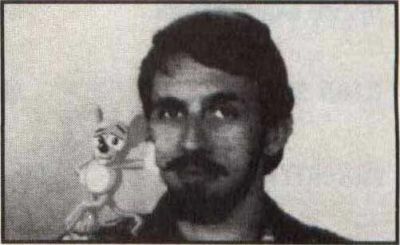 The "manual", which consists of instructions printed on the back of a small StarRay poster is written for the Amiga version. A small card featuring notes for the ST version accompanies this. The instructions are brief...too brief. There's a lot of glib writing, but not much useful information. For example, there is no mention of whether it is possible to recharge your shields or how to gain extra vaporizers. Neither is there even a hint that the destruction of all your installations will cause the end of the game. But, all in all, StarRay is a fun and playable game. It adds enough twists to keep it from being a blow-by-blow rerun of Defender, and the graphics add a lot to its appeal. If you liked Defender, you'll probably love StarRay. I just wish there was a #% §@# hyperspace button!